Recently, Mr. Valence spoke to our school population about three of our Lyme School values: compassion, respect, and responsibility. These values could not ring more true as our 5th graders learn the technique of belaying one another on the climbing wall recently in PE. Students understand the level of responsibility inherent in belaying someone to make a climber feel safe and respected during their climb. The climber determines their own pace and to what height they feel comfortable climbing toward. The belayer needs to show compassion for their climber and respect the comfort level of the climber. Communication is essential between the belayer and the climber and both need to listen to one another intently, using scripted and precise vocabulary to ensure that both climber and belayer are ready to take on climbing and guiding responsibilities on the vertical wall. Through clear communication, both can contribute to a safe, effective, and successful climb. 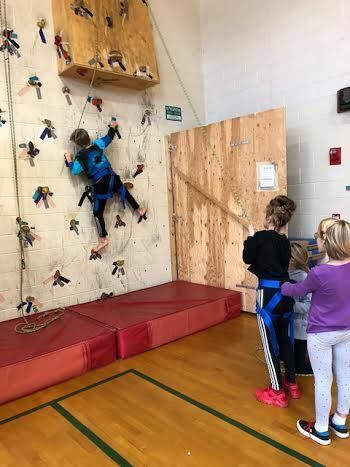 I am so proud when our students show trust and respect to one another, as well as taking on the serious responsibility of belaying the climb of a classmate. Well done, 5th grade! !